One of the most practical applications of precision medicine lies within the field of pharmacogenomics, a portmanteau of pharmacology and genomics. It is a discipline designed for tailoring drug treatments to an individual’s genetic make-up. 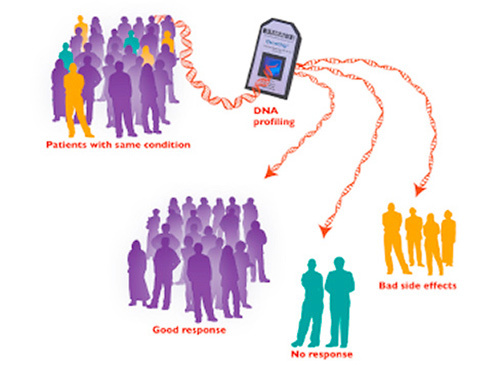 While scientists have had clinically relevant pharmacogenetic examples of drugs functioning only for patients with specific genetic backgrounds for several decades, the field has burgeoned into the encompassing specialty of pharmacogenomics, shifting away from observing a small number of candidate genes to searching for genome wide biomarkers. Interestingly, one of the first examples of pharmacogenetics occurred around 510 BCE, when the Greek philosopher and mathematician Pythagoras observed that the ingestion of fava beans were fatal to some individuals and not to others. What Pythagoras couldn’t do at the time was formulate a scientific hypothesis to provide him with an answer as to what had caused such a disparity in symptoms. Now we know about the disease clinicians often refer to as favism, which is a genetic mutation in the glucose-6-phosphate dehydrogenase gene that predisposes those with the mutation to potentially fatal hemolytic anemia in the presence of certain foods, drugs, or chemicals.